All praises are for Allah alone who is the Lord of all realms, the Creator of all creations and the Sustainer. He is eternal and immortal. There is nothing in both the worlds except the Divine Essence nor is there anyone else worthy of worship. Thousands of praises and salutations upon the leader of everything. Hence, he is the reason of creation, the pure existence of Holy Prophet pbuh, his sacred progeny, his companions and his devotees whose following is obligatory upon every Muslim. Every created thing is the manifestation of a Divine attribute but man is the best of creation because the infinite Essence with its countless theophanies is within him. When Allah came out of Oneness to multiplicity, He first manifested the Mohammadan Light from it. Then from the Mohammadan Light, He created all the souls. These souls beheld Allah in preexistence and claimed Him to be their Lord. Further, Allah dressed them with physical form and sent them to the realm of creation which is an arena of trials. Hence, the outward of a man is a realm whose reality is mortal like the world whereas his inward is a separate realm where the Divine Essence exists and is immortal. Hence, while staying in this physical form and removing all the spiritual veils to recognize the true Lord, to behold Him, to reach Him is the sole purpose of life. This proves that faith upon Allah means to love Him intensely. Divine Love dominates all other loves. Divine Love is madness and passion, loyalty and sacrifice and place of annihilation. Further, it is to erase one’s existence and annihilate in the beloved’s existence. This ends the difference between ‘you’ and ‘I’. The beginning of creation is Divine Love. Furthermore, the creation of man was for Divine Love. The existence of Allah was a hidden and concealed treasure and then a desire of recognition arose in it. The desire of recognition within the Divine Essence was so intense that it manifested in the form of Divine Love. It was Divine Love and the desire to be loved that made Oneness spread into multiplicity from its solitude. In this passion of Divine Love, Allah created the souls of the entire creation from the Mohammadan Light. Hence, the transfer of Divine Light to the human souls through the Mohammadan Light, was similar to the distribution of Divine Love. Unfortunately, after coming into this world, man wastes this love upon material relations instead of Allah and His prophet who are its rightful owners. In other words, the passion was for the closeness and vision of Allah was to succeed in hereafter. In terms of Sharia, it is necessary to fulfill the needs of one’s relations and work for livelihood but it is utter injustice that one gets so involved in these that he turns his back towards Allah. The true seekers of Allah understand this reality and hence, following the footsteps of the Holy Prophet pbuh, they work upon their relation with Allah alongwith managing worldly responsibilities. However, the pivot of their attention and thoughts as well as the direction of all emotions is only towards Allah. Their innerself, inward and soul is always igniting with the fire of Divine love. Hence, this fire is their life. What fear would they have of hell-fire as they have burnt in the fire of Divine love to the extent that they have converted into fire itself? O ascetic! Why do you scare me by the fire of hell? I have that fire of Divine Love igniting within me whose single drop can burn down hell itself. If a spiritual state overpowers the lover and heaves a sigh of fire of Divine love, or puts a glance of wrath, its intensity would burn each and everything from east to west. O Lord! Grant me the passion of Divine love as it your greatest gift. If someone fears it, then grant it to me. Divine lover is always in the Divine vision and if he, out of his pain of true Divine love and strong overpowering passion, heaves a sigh, its intensity would burn each and everything from east to west. There will not remain anything on earth. The Mystics do not appreciate to speak or listen about anyone else because as they are always burning in wonders and fire of Divine love. The gnosis of the love of Allah is the destiny of the Divine lovers. Divine love means to kill your ‘self’. Passion means to burn yourself in the fire of Divine love. In the field of gnosis, become the companion of your beloved. If you have intellect and passion then annihilate in the gnosis of Allah, as this is the way of dying for lovers. The spiritual worship of lovers is to drink their own blood i.e. they are ever-struggling and in pain of Divine love. Do not focus upon their outer state. Lose yourself and annihilate like a moth in your love for Allah. In the arena of Divine love, take step with courage and love. Do not stop even if you get behead during it. There are two kinds of Fakirs; the spiritual travelers and the Divine lovers. The spiritual travelers are the men of mystic struggle and endeavors while the lovers are the men of Divine secrets and observations. The final level of a spiritual traveler is just the beginning of the Divine lover because the sustenance of lovers is the spiritual endeavors and their sleep is the Divine observation. Meaning: Since your love has obsessed my being, I have no idea what I should do of my own self because two kings cannot rule one kingdom. The lovers of Allah are neither afraid nor frightened of anybody’s reproach. Listen O ascetic, the laborer of paradise! The food of lovers of Allah is all Light, their stomach is like burning stove and their sleep is actually the Divine union and presence. Divine love is a subtle passion if arisen in the heart from the hidden and does not find peace from anyone but the Divine Beloved, neither ever turns towards the creation. Meaning: I am passionate to behold my Holy Lord. From that soil, Allah created the bodies of His lovers, who remain in the state of Divine ecstasy and drowned in the ocean of Divine love till eternity. When the heart of a lover of Allah heaves a sigh out of pain of love, it extinguishes the hell fire because no fire is more intense than the fire of Divine love. Meaning: The hell fire is cooler as compared to the fire (of Divine love) burning in my heart. The heart which is not burning in the fire of Divine love will burn in the hell fire. Meaning: Such fire of love blazes in my heart that eventually my heart has become fire itself. Now, everyone is catching the fire of Divine love from my heart. Those who are ever engrossed in Divine Love, Allah grants them their destination before the day of judgment. He adorns them with the light of His theophanies. An adorer Fakir is the secret of Allah. Only the men of secret know the secret behind this secret. Explanation: The seekers of Allah who have found the real love do not remember Allah by tongue rather always remain absorbed in the invocation and contemplation within their souls. Their every breath inhales and exhales by invoking Ya Hoo ( یا ھُو ) and their beings remain engrossed in the physical, inward, spiritual, secret, hidden and concealed invocation. I sacrifice myself for such a perfect and accomplished spiritual guide who enlivens the dead souls by a single spiritual sight. 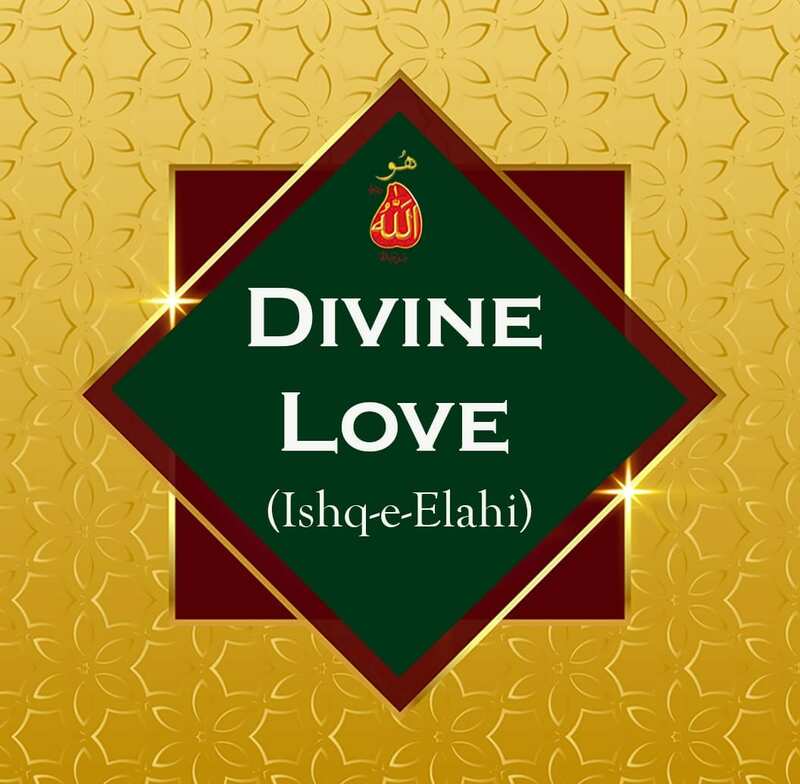 Moreover, according to teachings of Sultan Bahoo RA, Divine love is that emotion which connects the creation to the Creator. It is only Divine love, which makes the seeker get away from all inciting evils, satanic whispers and all sorts of sins to annihilate in the Divine Essence. Further, the beginning of Divine love (ishq-e-haqeeqi) is love for Murshid (ishq-e-majazi). The extremity of Divine love is that the lover converts into the beloved whereas the beloved converts into the lover. The religion of those who love Allah is Divine love. Neither are they customary Muslims nor like the ascetics who keep their heads bowed within mosques. The Divine lovers are those acquainted with the reality of religion and are absorbed in the Divine vision at every moment of their lives. Furthermore, it is Divine love which shows the way to the vision of Allah. The Fakirs found the bounty of the vision of Allah only through Divine love. To start the journey of Divine love, it is incumbent upon the seeker of Allah to give his hand in the hand of his Murshid. Sultan-ul-Ashiqeen Sultan Mohammad Najib-ur-Rehman is the Perfect Fakir of this era. Whoever wants access to the court of Allah must know that there is no other way to reach Him except this. May Allah bestow everyone with the ability to walk this path. Amen.